The Lower and Upper basilicas and the portico, as seen from the Lower Plaza of Saint Francis. The Basilica of Saint Francis of Assisi (Italian: Basilica di San Francesco d'Assisi; Latin: Basilica Sancti Francisci Assisiensis) is the mother church of the Roman Catholic Order of Friars Minor Conventual in Assisi, a town in the Umbria region in central Italy, where Saint Francis was born and died. It is a Papal minor basilica and one of the most important places of Christian pilgrimage in Italy. With its accompanying friary, Sacro Convento, the basilica is a distinctive landmark to those approaching Assisi. It has been a UNESCO World Heritage site since 2000. The basilica, which was begun in 1228, is built into the side of a hill and comprises two churches (known as the Upper Church and the Lower Church) and a crypt, where the remains of the saint are interred. The interior of the Upper Church is an important early example of the Gothic style in Italy. The Upper and Lower Churches are decorated with frescoes by numerous late medieval painters from the Roman and Tuscan schools, and include works by Cimabue, Giotto, Simone Martini, Pietro Lorenzetti and possibly Pietro Cavallini. 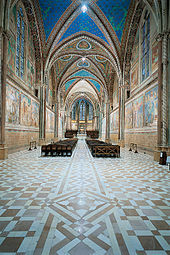 The range and quality of the works give the basilica a unique importance in demonstrating the development of Italian art of this period. On 16 July 1228, Francis was canonized by Pope Gregory IX in Assisi, and he laid the foundation stone of the new church the following day, although construction may already have been begun. The construction having been begun at his order, the Pope declared the church to be the property of the papacy. The church was designed by Maestro Jacopo Tedesco, who was in those days the most famous architect. The construction was supervised by Brother Elias of Cortona, one of the first followers of Saint Francis and the former Vicar General of the Order under Saint Francis. The Lower Basilica was finished in 1230. On Pentecost 25 May 1230, the remains of Saint Francis were brought in a solemn procession to the Lower Basilica from its temporary burial place in the church of San Giorgio (St. George), now the Basilica of Saint Clare of Assisi. The burial place was concealed for fear that St Francis' remains might be stolen and dispersed. The construction of the Upper Basilica was begun after 1239 and was completed in 1253. Both churches were consecrated by Pope Innocent IV in 1253. Pope Nicholas IV, a former Minister-General of the Order of Franciscans, raised the church to the status of Papal Church in 1288. The Piazza del Loge, the square leading to the church, is surrounded by colonnades constructed in 1474. They housed the numerous pilgrims flocking to this church. In 1818, the remains of Saint Francis were rediscovered beneath the floor of the Lower Basilica. In the reign of Pope Pius IX the crypt was built so that the faithful might visit the burial place of the saint. On the morning of September 26, 1997, two earthquakes hit that region of Italy in rapid succession, registering 5.5 and 6.1 respectively on the Richter Scale. There was widespread devastation and many ancient buildings were destroyed or damaged. While a group of specialists and friars were inspecting the damage to the Basilica of Saint Francis, an aftershock shook the building, causing the collapse of the vault. Two Franciscan friars who were among the group and two of the specialists were killed. Much of the cycle of frescoes of the life of Saint Francis by Giotto in the Upper Church of the Basilica were slightly damaged whereas those of the sections of the vault which collapsed were almost entirely destroyed. The church was closed for two years for restoration. The collapse was captured on tape. The architecture is a synthesis of the Romanesque and Gothic styles, and established many of the typical characteristics of Italian Gothic architecture. As originally built, both upper and lower churches had a simple cruciform plan with an aisle-less nave of four square bays, a square crossing, a transept that projected by half a bay on each side, and an apse, the lower being semicircular and the upper polygonal. To the left of the church stands a free-standing bell tower of Romanesque design. This bright and spacious basilica consists of a single four-bay nave with cross-vaulted ceiling bordered with patterns of crosses and leaves, a transept and a polygonal apse. The four ribbed vaults are decorated alternately with golden stars on a blue background and paintings. The second vault is decorated with roundels with busts of Christ facing Saint Francis and the Virgin facing Saint John the Baptist. The entrance vault gives us the Four Latin Doctors of the Church: St Gregory facing St. Jerome and Saint Ambrose facing St. Augustine. These are ascribed to the Isaac Master. The choir has 102 wooden stalls with carvings and marquetry by Domenico Indovini (1501). In their centre, on a raised platform, stands the papal cathedra. The west end of the transept and the apse have been decorated with many frescoes by Cimabue and his workshop (starting in c. 1280). The magnificent Crucifixion, with Saint Francis on his knees at the foot of the Cross, stresses again the veneration of the Passion of Christ by Saint Francis. The frescoes of Cimabue soon suffered from damp and decay. Due to the use of lead oxide in his colours and to the fact that the colours were applied when the plaster was no longer fresh, they have deteriorated and have been reduced to photographic negatives. The upper part on both sides of the nave, badly damaged by the earthquake of 1997, was decorated in two rows with in total 32 scenes from the Old Testament (starting with Creation of the World and ending with Joseph forgives his brothers) and the New Testament (from the Annunciation to The Women at the Tomb), while the upper register of the entrance wall is covered with two frescoes Pentecost and Ascension of Jesus. Since it took about six months to paint one bay of the nave, different Roman and Tuscan masters, followers of Cimabue, have performed this series of scenes such as Giacomo, Jacopo Torriti and Pietro Cavallini. But the most important decorations are the series of 28 frescoes ascribed to the young Giotto along the lower part of the nave. Each bay contains three frescoes above the dado on each side of the nave, two frescoes in the east galleries beside the entrance, and two more on the entrance wall. Giotto used the Legenda Maior, the biography of Saint Francis by Saint Bonaventure (1266) to reconstruct the major events in the life of Saint Francis. The prototype for this cycle may have been the (now lost) Saint Francis cycle by Pietro Cavallini in the church San Francesco a Ripa in Rome. The paintings are as vivid as if Giotto had been a witness to these events. According to Vasari, they were executed in the period between 1296 and 1304. However the authorship of Giotto is disputed, due to the ambiguous attributions given in early descriptions of this work. Many Italian critics continue to support the authorship of Giotto and his workshop. But because of small differences in style with the frescoes of Isaac, it is thought that several or even all of these frescoes were painted by at least three separate painters, using the original concept of Giotto : the Master of Legend of Saint Francis (the principal painter and probable supervisor of the cycle), the Master of the Obsequies of Saint Francis and the Cecilia Master. The doors are surmounted by a large rose window, flanked by two smaller ones, called "the eye of the most beautiful church in the world"  The decorations on the left wooden door were executed by Ugolinuccio da Gubbio (circa 1550) and those on the right door by an anonymous Umbrian artist (1573). They portray stories from the lives of Saint Francis, Saint Clare, Saint Louis and Saint Anthony. On the left wall of the porch stands the bust of Pope Benedict XIV who granted this church the title of Patriarchal Basilica and Cappella Papale. Pope Benedict XVI’s theological act in 2006 of renouncing the title of "Patriarch of the West" has had the consequence of the basilica changing its name to that of the Papal Basilica of St. Francis. Entering the lower basilica, one sees at the other side of the vestibule the chapel of Saint Catherine of Alexandria, erected about 1270. It was enlarged by Gattapone da Gubbio and decorated at the expense of Cardinal Egidio Albornoz, papal legate in charge of the Papal States (from 1350 to 1367). He was initially buried here but his body was later transferred to Toledo, Spain. The frescoes with the eight episodes from the life of Saint Catherine were painted in 1368-1369 by ‘Andreas pictor de Bononia’. This painter, called Andrea, is most probably Andrea de’ Bartoli (c. 1349 - 1369), the court artist of Albornoz (and not Andrea da Bologna, as usually, but wrongly, attributed). The saints in this chapel were painted by Pace di Bartolo d'Assisi (1344–1368). The stained glass windows are the work of Giovanni di Bonino of Assisi (mid-14th century). On the left side of the entrance is the small Chapel of St. Sebastian with a canvas by Giorgetti and episodes of the life of the saint on the walls painted c. 1646 by G. Martelli (Irene taking care of St. Sebastian; St. Sebastian before Domitian). The left wall of this chapel is decorated by some paintings by Ottaviano Nelli (15th century) and a painting of Saint Christopher (Umbrian School, 14th century). The first chapel on the left is the San Martino Chapel, dedicated to Saint Martin of Tours. It was built by the Franciscan Cardinal Gentile Portino da Montefiore and was decorated between 1317 and 1319 with ten frescoes depicting the saint's life by Simone Martini. This dedication most likely referred to the Cardinal's position as Cardinal-Priest of the Basilica of St. Martin "ai Monti" in Rome, and was intended to be his burial place. It was probably incomplete at the time of Montefiore's death (October 1312), thus he was interred in the neighboring Chapel of St. Louis. Martini also painted a triptych depicting the Madonna and Child with Two Hungarian Royal Saints with a row of five attendant saints in the St. Elizabeth Chapel (southern arm of the transept). These are among the greatest Martini's works and the finest examples of 14th-century painting. Over time, however, his use of lead paint has led to the darkening of several sections of these works. Saint Martin leaves the life of chivalry and renounces the army (fresco by Simone Martini) in the San Martino Chapel. Maestà with Saint Francis, by Cimabue. On the transept wall Cimabue painted an image of Our Lady enthroned and Saint Francis (1280). This is probably the nearest likeness existing, showing the actual appearance of Saint Francis. This static painting in Gothic style is in stark contrast with the lively frescoes of Giotto. The left transept was decorated by the Sienese painter Pietro Lorenzetti and his workshop between 1315 and 1330 (attributed by Vasari to Pietro Lorenzetti and also (wrongly) to Giotto and Puccio Capanna) . This cycle of tempera frescoes are his masterworks. They depict six scenes from the Passion of Christ. The fresco of Deposition of the Cross is especially emotional. There were about 330 work-stages needed to complete this cycle. Beneath the monumental "Crucifixion" scene, Pietro Lorenzetti has executed a fresco of the Madonna and Child, accompanied by Saints John the Evangelist and Saint Francis (the so-called Madonna dei Tramonti). The fresco is accompanied by a frescoed niche containing the liturgical implements and a fictive bench. Halfway down the nave one can descend into the crypt via a double stairway. This burial place of Saint Francis was found in 1818. His remains had been hidden by Brother Elias to prevent the spread of his relics in medieval Europe, a story told by Jon M. Sweeney in The Enthusiast. By order of Pope Pius VII a crypt was built under the lower basilica. It was designed by Pasquale Belli with precious marble in neo-classical style. But it was redesigned in bare stone in neo-Romanesque style by Ugo Tarchi between 1925 and 1932. At the entrance of the crypt, an urn with the remains of Jacopa dei Settesoli was added to the crypt. This woman of Roman nobility, affectionately referred to as "Brother Jacoba", was the most faithful friend and benefactress of Saint Francis. She was at his side in the Porziuncola at the hour of his death. ^ Pope Benedict XVI (9 November 2005). "Totius Orbis Of The Holy Father Benedict XVI for the Coordination of Pastoral Activities and Initiatives at the Basilicas of St Francis and of St Mary of the Angels in Assisi". Apostolic Letter "Motu Proprio". Holy See. Archived from the original on 9 July 2011. Retrieved 16 August 2011. ^ Croci, Giorgio (2000). "Emergency Stabilization of the Basilica of St. Francis of Assisi" (PDF). Cultural Resource Management. Washington: National Park Service - US Department of the Interior. 23 (6): 30–32. Archived from the original (PDF) on 2009-01-09. Retrieved 2009-05-17. ^ Croci, Giorgio (2001). "Restoring the Basilica of St. Francis of Assisi" (PDF). Cultural Resource Management. Washington: National Park Service - US Department of the Interior. 24 (8): 26–29. Archived from the original (PDF) on 2009-01-09. Retrieved 2009-05-17. Bellucci, Gualtiero (2001). Assisi, Heart of the World. Assisi: Edizioni Porziuncola. ISBN 88-7135-131-2. Bonsanti, Giorgio (1998). The Basilica of St. Francis of Assisi. New York: H.N. Abrams. ISBN 0-8109-2767-5. Belting, Hans (1977). Die Oberkirche Von San Francesco in Assisi: ihre Dekoration als Aufgabe u.d. Genese einen neuen Wandmalerei. Berlin: Mann. ISBN 3-7861-1135-9. Borsook, Eve (1980). The Mural Painters of Tuscany: From Cimabue to Andrea del Sarto. Oxford: Clarendon Press. ISBN 0-19-817301-6. Lunghi, Elvio (1996). The Basilica of St Francis at Assisi. The frescoes by Giotto his precursors and followers. London: Thames & Hudson. ISBN 0-500-27834-2. Turner, J. (ed.) (1996). Grove Dictionary of Art. Macmillan Publishers Limited. ISBN 1-884446-00-0. Vasari, Giorgio (1998). Vite. Oxford University Press. ISBN 0-19-283410-X. Smart, Alastair (1971). The Assisi Problem and the Art of Giotto: a study of the Legend of St. Francis in the Upper Church of San Francesco, Assisi. Oxford: Clarendon Press. ISBN 0-19-817166-8. Wikimedia Commons has media related to Basilica di San Francesco. Wikimedia Commons has media related to The legend of Saint Francis painted by Giotto.